Kale Recipe - here's a yummy recipe for kale. A good basic kale recipe is essential for one's repertoire of recipes because it is so nutrient rich. It's a basic cancer prevention food, one of the super foods and really quite beautiful, crinkly, ruffled or smooth leaved in beautiful, dark greens, purples or red leaves. Kale is in the cruciferous and cabbage family and doesn’t seem to be as eater friendly as many other dark leafy greens like silky spinach or chard. That's probably because people aren’t sure how to prepare it with it's super hearty flavor. However, with the right seasonings and other ingredients it can be quite tasty as in the recipe below. Chop the kale in 1” pieces and steam for 15 – 20 minutes until it is tender. Remove from the stove and drain well. Place in a bowl and add the rest of the ingredients and mix thoroughly. Throw another handful of feta cheese on top and serve hot. I love this cooked kale recipe because it quite amazingly tames the strong cabbage flavor of the kale and brings out it's best robust qualities. The feta and pumpkin seeds add just enough zip. You can eat kale raw if you're really brave. If you stack the greens and roll the leaves up you can slice them into thin ribbons so it can be added to a salad. You could even have an all kale salad that you marinate for a while to let the flavors really soak the leaves. It won't get all soggy and unappealing. Another way to consume kale is just to have the raw kale on hand already washed and chopped and stored in a zip lock baggie wrapped in a paper towel. When you make your morning or afternoon smoothie, add a handful of kale to get more nutrition and cancer protection. It really does not change the taste of the smoothie but adds another serving of a super, nutrient rich vegetable which you need for optimum health. Remember you need 6 - 8 servings of vegetables and fruits every day. 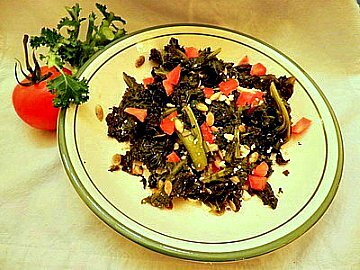 Return from Kale Recipe to Low Glycemic Recipes.